High Wave - A Top Brand USA Drinkware Designer. The AutoPupCup is a travel mug designed for smaller canine friends. 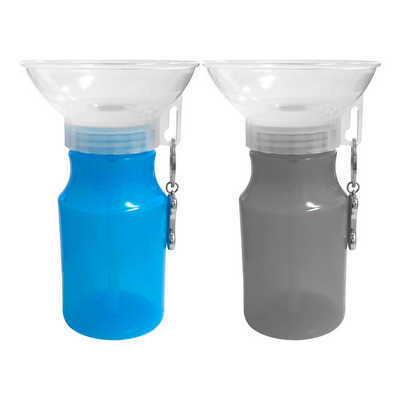 Squeeze and water is delivered in the bowl, release and water returns to the bottle. Fresh wter for your dog prevents health issues from public water bowls. - Fits in the car holder;. Non-spill top;. Leak tight, food safe, BPA free;. Product Dimensions: 117 mm x 117 mm x 177 mm. Capacity: 14oz. Printing Area: 35 mm W x 30 mm H. Colour Range: blue, clear. Decoration Methods: Pad Printing. Price includes : 3 days 1p engraved. Setup is not included, please ask for a final price from your sales representative.